Listening to a favourite piece of music that I recorded years ago, I hardly notice the jump in the middle. I had meant to turn the CD player off while someone said something, and instead hit the record button. I now have a unique recording of Mendelssohn’s Italian Symphony that has a baby crying in the middle of it. I play the music regularly, and have actually come to enjoy the brief exclamation in mid-symphony. I even know when it arrives – I have built it in to my own memory of the piece. Life is full of imperfections – and not just ones that are forgotten or even revered in someway. I live above a supermarket and can often hear the public address system minutes before I fall asleep. Like the baby in the symphony though, I have learned to live with it – I do not allow it to disturb my peace of mind. I rail against hooting horns – another feature of the square in front of my window, but don’t mind the pa announcements from the shop. Asking myself why, I come up with the answer that whereas one is necessary, the other isn’t. That doesn’t explain my accepting the child in my symphony though, does it? That probably has something to do with my ability, and indeed my willingness, to put up with less than perfect conditions. It may also be connected to my laziness; an unwillingness to do anything that is not absolutely vital. As a teacher, I have found that this ability is an important part of coping with things that might be more annoying at home. The electricity outages I frequently had to put up with in Sudan were a source of irritation and annoyance at first, but like the dripping of a tap, you quickly learn to ignore it – particularly if you are powerless to do anything about it. The ability to ignore some kinds of problems – a certain amount of resignation to them, is most probably one of the most important of our abilities. Assimilating the hiccup into part of the enjoyment of the event – learning to love it, seems to be the poor man’s lot, I’m afraid. It is difficult to form any real impression of a people after spending ten days in a hotel. Some things are readily recognizable – the formal welcome of the check in, the helpfulness of the concierge, the politeness of staff in and around the lobby. All that can be found anywhere. It is when you step outside that you get closer to reactions that are more authentic and slightly more indicative of what the indigenous people are like, but even then, you don’t get that close – not really. For here you are – an obvious tourist; your camera around your neck, florid shorts and tee-shirt, carrying a small backpack, wearing a baseball cap to keep the sun off – you are instantly recognizable – if you dress like that. I don’t, though I do carry a camera and a small bag with my things in it. Walking along the corniche in Alexandria, from the less crowded end at Montazah, we head for a man selling something he has cooked on a charcoal stove – it is sweet potato and very delicious. Whether he slightly overcharged us because of who we are, who we appear to be, we cannot tell. The price seemed reasonable so we partook of what was on offer. What if the sweet potato seller had charged us a little over the odds – more than he would have charged an Egyptian passer-by, would we be upset and feel cheated? I doubt it for something as negligible as a snack. It is only when you want something either more expensive or something you have the equivalent of where you come from that you feel you have been ‘done’. If you sit down in a café and drink a cup of tea, you often don’t ask the price of it – it seems churlish, almost rude. A cup of tea costs about the same all over the world – it will certainly be more expensive in central London or Berne or Stockholm, but in Egypt, you reason, it will be cheap, and it is. Whether it is the same price to a local doesn’t really enter your head. Now let’s try buying something more expensive – a leather jacket, for instance. Now you want two things, a reasonable price and good quality. You get both and you are happy. If one is wrong – the price is too high, or worse, the quality is poor, you are more dismayed – you leave the shop without buying anything – you tar all the jackets and their owner with the same brush. Outside the shop you shake your head and move down the street on the look out for another shop selling leather jackets – a better quality of shop. It’s a nice surprise then when you find a place that sells good quality jackets at a price that you think is reasonable. It is even nicer to be sold it by a gentleman – a former sailor – a captain, who, having sailed the seven seas, broke ice in the Artic, crossed the equator countless times, stayed ashore in Lisbon and Valetta, and who now looks after the shop for his ailing father, Ibrahim – well known around these parts, who has his own leather factory behind the shop. You feel you have been treated fairly – you saw the photo album of the slightly younger, fitter looking man who now sits before you offering tea, you inspect the jacket, look at each other as if to say, “This looks OK, doesn’t it?” and you cough up. Later in the hotel room, you try it on and it looks better than it did in the shop – it’s a nice fit, a good colour and you are pleased with yourself. All is as it should be. Buying something should be like that, not traumatic or stressful. 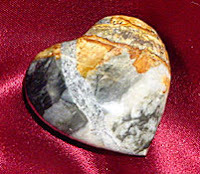 When it is the other way – stressful and traumatic, you are right in not opening your wallet or purse to the prevailing winds. 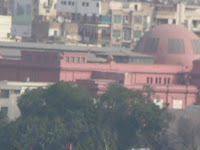 Walking around Cairo, looking for the Egyptian Museum, thinking happily that at last you will get to see the golden mask of the boy Pharoah, Tut-ankh-amon, the last thing you want is to be told that the somewhat drab, pinkish building down the street is closed, that it doesn’t open for another half hour or more. The man who lets you into this says he is a teacher, that he can show you a nice little museum to pass your time until 12.30 when the bigger one opens its celebrated doors. The other, smaller museum, is always just around the corner. This one is a ‘papyrus museum’ it has the word ‘government’ painted in garish blue above the door. We know this is a sham, and we know we have been had, and turn in and quickly out of the place. The man who gave us the information is, of course, nowhere to be seen, though we do see him again later as we near the museum housing Tut’s death-mask; he is giving another couple of tourists the once over. We can almost hear him telling them that he is a teacher. 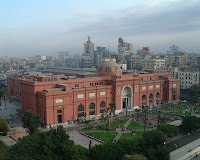 The Egyptian Museum turns out to be everything that is said it is, and more. It has a small bookshop on the way out in which the staff are almost invisible – helpful when asked but not pushy or insistent. After all, it’s not their business. They don’t get paid commission on anything bought, so they leave you alone. In the small but well appointed Museum in Luxor things are different; the man selling a quite nice selection of books about the Pharoahs, Luxor Temple and Egypt in general seems to be on commission – but he doesn’t know his customer, at least he doesn’t know me. When I browse around this kind of shop, I don’t want to be continually offered knock-down prices, and I don’t want to be continually harangued to buy something, however reasonably priced it is. What I want is service, when I want it. I want some knowledge imparted to me when I ask for it. “Does this book really tell the story of Hatshepsut’s ascendancy to the throne of Egypt – or not? Its price, I can get from inside the back cover or somewhere equally prominent. I am only concerned that it is the right book for me in terms of content first – if that is not right, I won’t buy it no matter how much the price has been reduced. If it is, I will be happy to pay what I think is a fair price for it and I will consider myself fortunate to have found the very book I have been looking for and will consequently be happy with the man for pointing it out to me. But I will not be happy to be pushed into buying a book I don’t want, or can’t afford, no matter how good the sales pitch is. I do not want patter in a bookshop, I want intelligible, informative, accurate advice. Checking out of the Sheraton Cairo on our last morning, I do not expect to find a car parking fee on my bill, and nor do I expect to be billed for 18 – yes 18 telephone calls I haven’t made. I can, however, appreciate that this might be a genuine mix up, I am getting 902’s bill instead of my own from 901. What I find harder to take is charging me for the little sachets of tea and coffee left for our convenience in a saucer at the side of two cups and an electric kettle. I take it that those are included in the 100 USD I am paying per night in this magnificent hotel. 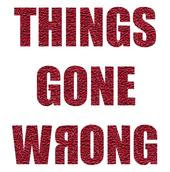 It’s not the money – well, actually it is, but it’s the principle – the fact that I am being charged for something I get for free in four and five star hotels in Kuala Lumpur, Abu Dhabi, Bangkok and Singapore. Before we leave Cairo, let’s eat; there is probably nowhere nicer than Felfela Restaurant in downtown Cairo – actually on Talaat Harb Street. Here the ambience is wonderful – one can feel the elegance of people who eat here. The lady sipping water at a table near the entrance does so every day of her elderly life – she is the owner’s mother and is justifiably proud of her daughter’s business acumen and her cooking. The head waiter, an elderly gentleman in immaculate livery, is patient, helpful, alert to his customer’s requirements, and solicitous of their need to eat well cooked, hot food. When the food promptly appears, it is well delivered and well cooked – it is lovely, delicious – everything that food should be. The one man who left a lasting impression on me, but who I had the good fortune not to meet face to face, was the young man who imagined he could steal something small and made of gold and of course very ancient and precious from the very room in the Egyptian Museum we had been dying to visit. This young man, I read yesterday on the Internet, stayed behind in the museum when all the doors were locked for the night. He hid himself in the toilets until it was safe to come out. He then prized open a glass display case, took several things, a golden dagger amongst them, and waited for the morning to come. He planned to just walk out with the other visitors when he would melt into the background as just one more of the hundreds visiting the museum that day. He was caught, I am pleased to say, before he could abscond with his ill gotten gains. The missing items had been missed, and he was caught with them. Apparently, he looked as if he had spent the night awake, which of course he had. He was taken away, as they say. I have two questions here; the first is to the young thief – where did he expect to sell his ‘finds’, undoubtedly worth a small fortune; the second question being to the authorities charged with keeping the museum and its priceless exhibits secure – how was this allowed to happen? This last event sort of sums up my feelings about Egypt; it is a country with a wonderfully rich past, a legacy from 40 centuries, and yet it is held secure in a sort of cavalier attitude as if it the exhibits were no more than poor farm implements from the last century. Perhaps that too is the appeal of Egypt; that they do not take themselves or anything too seriously. That is not quite true; they take money a little too seriously for my liking. This is not to say that I don’t care for Egypt and its people – I do, but I take what they say with the pinch of salt it deserves and with which they most probably intend it to be taken. Think of Egypt and you think of the pharaohs, the Muslim brotherhood, Presidents Nasser and Mubarak, President Anwar Sadat who was assassinated by one of his own, you might think of all of these or none of them. 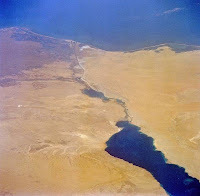 I remember President Nasser giving the world a shock or a reality check by nationalizing the Suez Canal in the late 50s. His actions brought the world to the brink of a world war, and led the then British Prime Minister, Sir Anthony Eden’s wife to relate that during the Suez Crisis, she felt as if the whole of the canal was flowing through her living room. Nasser was an immensely popular figure in the Egyptian politics of the day; he stood up to the Western powers and probably gave his people some pride back. The world pulled back from a conflict that would have involved the world’s major powers, and since that time the canal has fallen into a decline of sorts with the bigger oil tankers and merchant ships unable to sail between its banks. President Anwar Sadat paid the ultimate price for brokering a peace treaty in the tormented region – he was assassinated. President Mubarak, the present incumbent, is still alive and well and steering his country between the opposing forces that occasionally threaten the peace of his nation. 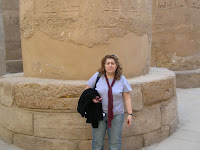 When I think of Egypt, I immediately think of my own father who passed away a few years ago. As a young conscript, a sailor in the Royal Navy, he sailed to Port Said and then guarded the canal for the next two years. He did not enjoy the experience generally. Who would? Although ostensibly neutral, or at any rate, not hostile, my father spoke of crowds of irate Egyptians pushing against bulging wooden doors while he stood bayoneted rifle in hand in the event that the door gave way. He didn’t have many good words for the people he had come to guard from the threat of Hitler’s armies, but his stories were mostly of young lads from British shores and their never ending ‘battle’ with their commanding officers – petty officers, captains and the like, and extended from Queen Street Barracks in Pompey to the shores of the Med and the Red Sea. 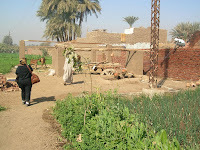 Our recollections of the people of Egypt mostly centre around our recent visit there. We met hoteliers, waiters, couriers, shopkeepers, museum curators and Luxor guides, and that other species of people, the chisellers of the street of Cairo. Like the cockney born in the sound of the bells of Bow Church, Cairenes are not to be taken as being represented by used car salesmen in the case of London, or ‘street con-men’ in the case of Cairo. Guide books quick to relate the ‘hotel scam’ perpetrated by taxi drivers meeting you at the airport, are equally rapid in their assertion that normal, decent people from this enormous city would not dream of frustrating your movements for their own gain. Said, our guide around the tombs of the valley of the kings on the West bank of the Nile at Luxor, contributed to what I said was one of the most interesting days I have ever spent in my life. Said constantly punctuated his narrative with searching questions to check if we understood. Feeling like a student again is no bad thing for a teacher to experience occasionally; it reminds you what the people sitting at their desks in your classroom feel like, hour after interminable hour. 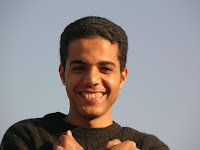 I enjoyed the company of his friend, another guide, Mohammed. That is all I know of him, though I am sure he will recognize himself from this description. 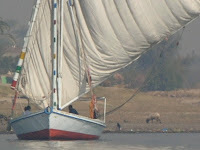 Mohammed took us down the Nile on a skiff to a small hamlet to drink tea and look around the menial dwellings there. 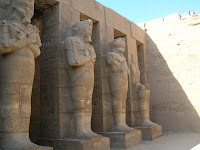 He guided us around a crowded Luxor Temple, mouthfuls of information at every pylon and pillar. When another tourist tried to latch on to his narrative without paying, though we hadn’t paid for this part of our day, he dismissed him briskly, shaking his head in disbelief. When the muezzin called the faithful to prayer, Mohammed begged us pause while he moved his lips and hands in some abbreviated form of prayer. When we handed him what we though was a suitable sum of money for all the words he had spoken to us, he almost blushed, telling us that he was embarrassing him. He took the money, but at least he had the grace to help us think it was not necessary. 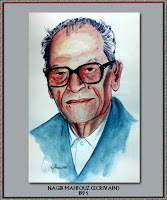 My wife and I both felt that my father should have visited Egypt again after his less than pleasant experiences of wartime Cairo, Port Said, Suez and Alexandria. We felt he had a sort of unfinished business with the country that took two years from his young life at a time when otherwise he would have been learning a trade in the engineering industry. Instead, he was demobilised in 1945 without a trade, and too old to start one. The rest, as they say, is history; he met the love of his life, a young woman from Greenfield, fell in love with her and married her in 1949, some good few months before I came along. My mother fell for a lad who had been overseas, fought in the War, been to places she could only point at in an atlas. 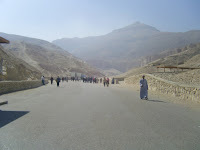 That he knew his way around Cairo and Alexandria must have impressed a young lass who had barely been out of her valley. 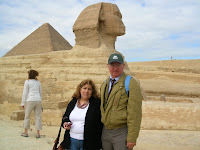 Together, they have visited many foreign capitals: Valetta, Tangiers, Rome, Paris, Ankara, Nicosia, but never Cairo. His only ever tour of Egypt was courtesy of Her Majesty’s Royal Navy. 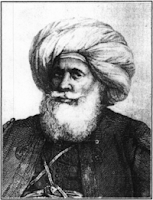 He often rued the day he ever set foot in Egypt, but to the day he died, he never stopped talking about it – it was part of his life, as it has become a part of mine – fascinated by a country that was home to pharaohs, generals and kings, and to the urchins who eke out a living in its sordid slums before making their pile in the industries that serve the Gulf states. 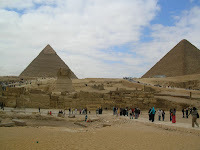 The pyramids at Giza - when awesome really does mean awesome! The pyramids have been impressing since they were built to house the tombs of the Pharaohs. To gaze upon them, the novelist, Evelyn Waugh wrote, was like being at close quarters to someone famous – like sitting at a table near to the Prince of Wales, you keep glancing at them to see if they are still there. 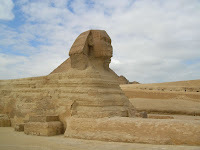 The pyramids and the Sphinx below them irresistibly draw the eye. 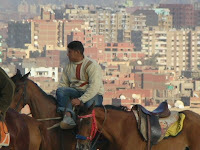 Approaching Giza from the centre of Cairo, a drive of about twenty minutes, they are not visible until quite close. The tenements, tower blocks and slums of that part of the city obscure their view until the taxi draws up in front of them. 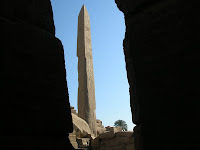 By the illusion of foreshortening (something familiar to steeplejacks and mountaineers) they appear nearer than they are and much lower in height than they would standing atop the biggest one – the Pyramid of Cheops. They were already more than 2000 years old when the historian Herodotus visited them – what he would say now, looking at them from the Pizza Hut opposite we can only guess. Cecil Beaton said that they had been degraded into commodities of an enormous tourist trade, and while that is undoubtedly true, it is impossible for anything to detract from their grandeur and scale. Standing right up against them really does make you aware of how very colossal they are. In the wonderful Light and Sound Show later, we are informed of the number of blocks of stone that were used in their construction and we can only marvel at the feats of strength and engineering skills that were used to build them. Without the aid of machinery save that which was manually operated, the 2.5 million blocks weighing 6 million tonnes were manipulated into position, after the Herculean task of getting them to the site in the first place. The organization of labour needed to achieve such a huge undertaking would impress even F.W. Taylor with his Scientific Management utilized so successfully by Henry Ford in his automobile factories in Detroit. 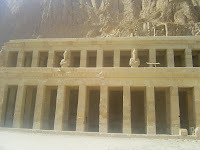 The power, the will and the ability to construct these mausoleums for the dead Pharaohs display all the greatness of the age of these kings of Egypt. They surely kept the people from idleness, as Pliny suggests, and in their building, the subjects would have continually been aware of their rulers’ hegemony. Other, more recent rulers have had mausoleums constructed, and while they are admittedly much less impressive and smaller in scale, they nevertheless do have what it takes to inform present and future generations of the greatness of those interred within. Walking into this treasure house of a museum, and knowing that it houses what is arguably the most spectacular exhibit in any museum in the world – the golden mask of the boy king; the Pharaoh Tutankhamen, one is constantly distracted, even whilst looking over the other magnificent trove of Upper and Lower Egypt contained within the Egyptian Museum in Cairo. What would probably pass for major exhibits in another museum, here pale into insignificance compared to the granite statues of the great and the godly. 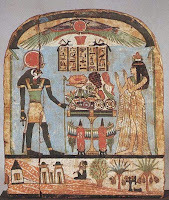 The stela of different events in ancient Egypt portray a world that predates almost everything. Alchemy – from the Arabic Al Kheme, meaning ‘of Egypt’, was born here as Pharaohs believed that base metal could be turned into gold. The science of geometry and al-gebra were certainly used to construct the pyramids, and the means - mechanical, to move blocks weighing tons, or, as some now think, to cast the blocks of which the pyramids are built, was certainly known and expertly carried out in those early days of the Old Kingdom. Realising that these pyramids, though magnificently colossal, were in fact useless at their main task – preventing the treasures and bodies of dead Pharaohs seeking the way to the afterlife, from being robbed, the kings of the New Kingdom went up the Nile to Thebes, now Luxor, to inter their great kings with their booty in what they imagined to be sufficiently remote locations to be safe for all eternity. Howard Carter discovered the tomb of King Tutankhamen at the very end of two years of fruitless, backbreaking effort. His sponsor and provider, Lord Caernarvon, had all but given up and was ready to recall Carter before he looked in one last place, below the huts of excavation workers, ironically, to arrive at his ‘day of days’ when he went into the tomb and saw its magnificent contents. That trove is here for all to see, in a temperature controlled, guarded room where everything is behind glass and guards stand by to protect these last accompanying artifacts to the Pharaoh. 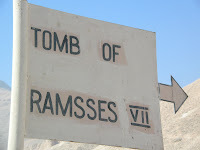 I could only wonder what has been lost from the other tombs in the Valley of the Kings, as well as from the pyramids at Giza. Here are the things the young king had to accompany him to the afterlife, entombed with him in what was one of the smaller tombs. What did the fabulous tombs of the mightiest contain? 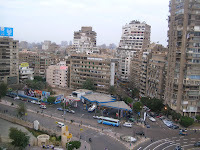 Like any large city, Cairo has its problems. With around 15 million people living within its city boundaries, it is no wonder. Visiting the city for the briefest of moments, the main problem one encounters is the volume of traffic. This is nowhere near the problems that a city like Bangkok faces, but it is still a problem. 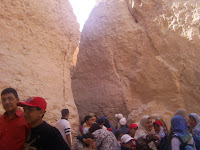 The other problem for the visitor – an obvious foreigner carrying a camera and wearing casual clothes, is the touts that continually touch your elbow, ask you where you come from, say they are your friend and ‘offer’ to take you somewhere more interesting than the place you had intended visiting. Not being used to such behaviour, you might take this ‘offer’ to be a kind one, given by someone who actually wants to help you as you struggle to find your way round this enormous city. If you were walking around Glasgow, for instance, nobody would approach you or offer anything unless you spoke to them first. Here it is different. 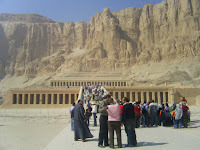 To begin with, there is a huge difference in cost and standard of living between Egypt and the tourist’s country; particularly if the visitor is from a European or North American country. Second, tourism is one of the country’s biggest earners of foreign currency; “they're just out to capture your dime”, as Americans would say. 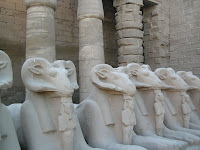 Wandering around trying to find the Egyptian Museum, you quickly become the tout’s prey. In the crowded streets of the capital’s downtown shopping area, there is no such problem. If you step into a shop, the assistant will do all in his power to ensure that you don’t step out again without buying something first, but even this is done in a Western manner. 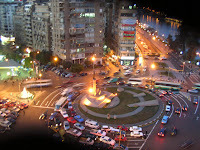 Taxi drivers in Cairo are no different from taxi drivers anywhere – they want to take you further than you want to go for more than you want to pay. Agreeing on the price for our chosen destination seemed to work, with help from people who know about such things – hotel commissionaires and the like. Really, the hassle and the traffic urge you to leave, or at least want to leave. 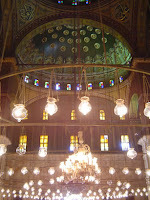 There is plenty to see in Cairo, but it is sometimes difficult to not see the wood for the trees. 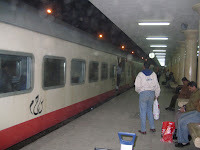 A 15-hour train journey from Alexandria up to Luxor, although very tiring, didn’t put us off taking the sleeper back down the Nile valley at the capital. We had booked the all night- sleeper at 94LE. We would be able to sleep, have breakfast and wake up refreshed in Cairo ready to continue our tour of this interesting country. And it worked out that way too – well almost. 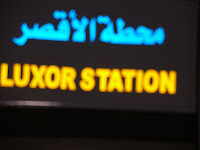 We boarded the train after being harangued by porters at Luxor Station. The platform was full of passengers – mostly Egyptians with a few tourists like ourselves. Back in the bad old days – the late 90s, the treat of terrorist attacks meant that the army or militia were on board, but tonight there were just ordinary looking railway officials. Show to our berths by the helpful young man whose job it is to look after the passengers, we were pleasantly surprised how much room we had and how comfortable it looked. Initially though, the complexities of how each bunk bed folded down had us beat. Deah, the attendant, fluent in five languages as well as his own native Arabic, helped us down with the beds – actually, he bade us step outside while he expertly and quickly pulled each bed down from its vertical place above our heads. The food tasted and looked a bit like the stuff you get on a plane, but it was reasonable and we enjoyed it. With full stomachs and visits the small but quite clean bathroom over, we settled down to sleep. The roll of the train disturbed us both and at one time we felt like we were at sea, but we soon settled in to it and slept until a soft bell woke us at 4.30am for tea or coffee. Arriving at around six in the morning in Cairo, we did feel a little sleepy, which is hardly surprising after only about four hours sleep. 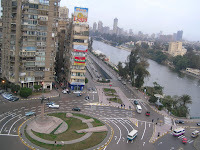 At times like that, the last thing you want to have to cope with are the taxi drivers of Cairo. I had read about the ‘hotel scam’ in the good ‘Lonely Planet Guide’ just earlier. Even so, I wasn’t ready for it, not really, maybe because I didn’t expect it to happen to us. You read about these things in guide books, little imagining that you will be their next victim. With check in at 3.0pm, we were mighty grateful when the receptionist upgraded us to deluxe for the same tariff. 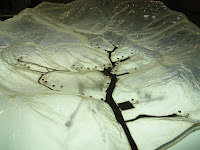 If we’d had to find a hotel after that trip, I think we would gladly have been taken anywhere; prebooking is advisable. 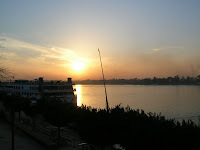 There are many ways to leave Luxor, and there are many directions in which to leave. 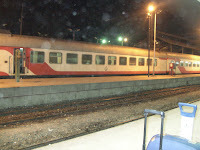 The overnight train to Cairo leaves at 8.10pm from Platform 2; the train up the Nile to Aswan leaves in the afternoon as tired passengers alight after the 12-15 hour journey from Alexandria through Cairo and on up the Nile valley past field after field of sugar cane. 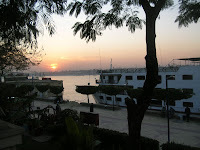 You can leave Luxor for some few days on one of the many boats/ships/barges, I know not what to call them, up the Nile to Aswan. There you can visit Abu Symbel temple and look south into Sudan. Thousand upon thousands of years ago, the Pharaohs of the New Kingdom, Hatshepsut, Tut-ankh-amon and the others, whose defiled toms lie in the Valley of the Kings on the West bank of the Nile, left Thebes and this life for the afterlife they believed was theirs to live anew. If their heart did not outweigh the two feathers of Truth and Justice, they were allowed to pass. Their mortal remains were either mummified, or else contained in the Canopic Jars used to hold their internal organs – liver and lungs but not the heart – that had to be weighed by the gods. 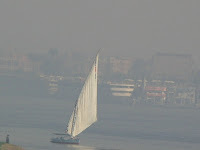 Holy barques were prepared for the journey and they left Luxor - forever – who knows?